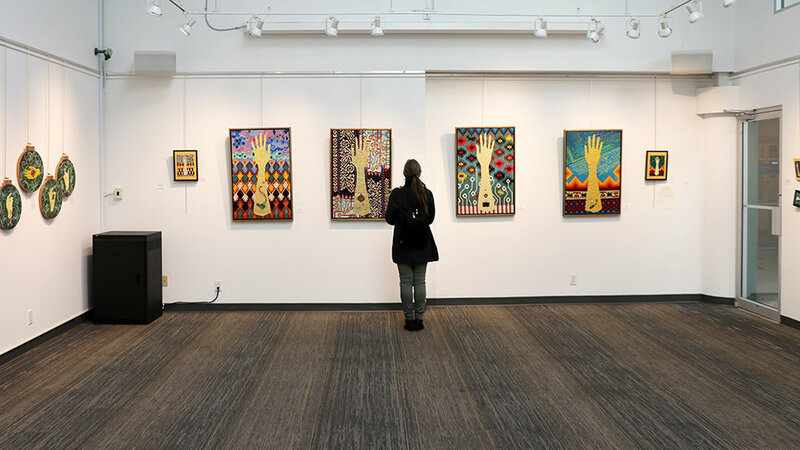 While in Vancouver, I visited Barbara Heller’s tapestry show in the Zack Gallery in the Jewish Community Center. The show is called Divine Sparks. 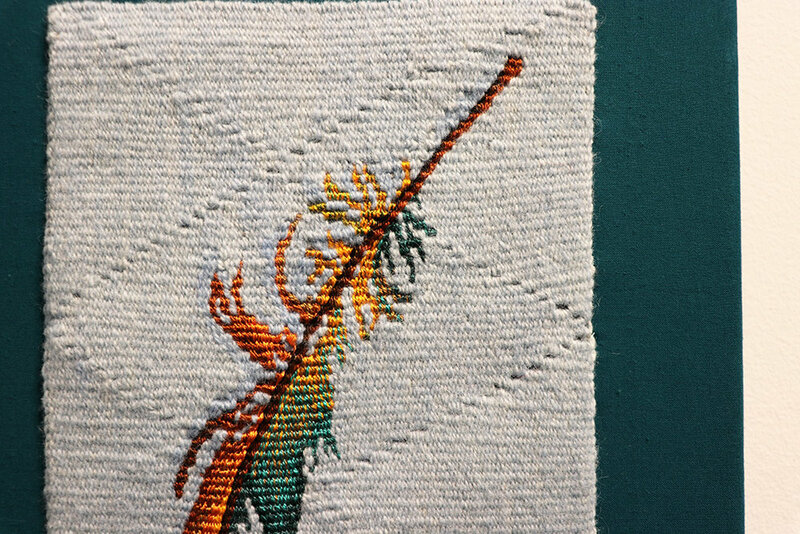 Barbara’s work has long been some of my favorite work in tapestry. Take a look at some current and past work in the photos below and then check out her website linked at the end of the post. Her work often deals with issues of humanity’s relationship to the environment but her work is extensive and varied and well worth study. 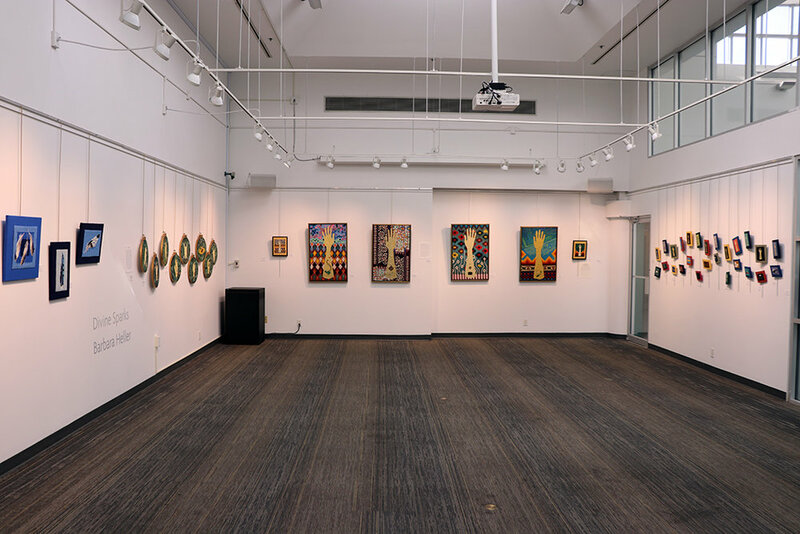 The centerpiece of the show is Tzimtzum – Transcendence which won the Teitelbaum award in the latest American Tapestry Biennial (American Tapestry Now) juried by Włodzimierz Cygan. I really enjoyed the opportunity to see this piece in person and study it carefully. This is what Barbara says in the catalog for World Tapestry Now about this piece and her work in general. This tapestry is symbolic of our unfolding journey from our physical selves to our spiritual home. The ladder can be seen as a metaphor for our life, as a liminal space between birth and death, heaven and earth, matter and spirit, tzimtzum (contraction) and tikun (healing through good deeds). As in the story of Jacob’s dream in the Torah, the ladder is a bridge that allows us to travel in both directions. The squares could be seen as the angelic messengers in Jacob’s dream but to me they are stepping stones on the path of spiritual attainment, of transcendence. The pieces below are some of her newest work. I was enchanted by these feathers. The series is called The Sephirot. In Kabbalah, the Sephirot (emanations) are 10 attributes through which G-d reveals Itself and continuously creates both the physical realm here on earth and the spiritual realm of higher metaphysics. Barbara has collected feathers for many years and she talked about weaving those feathers including all the holes where they had disintegrated in storage. You can see some of these holes below and in the gallery at the end of the page. 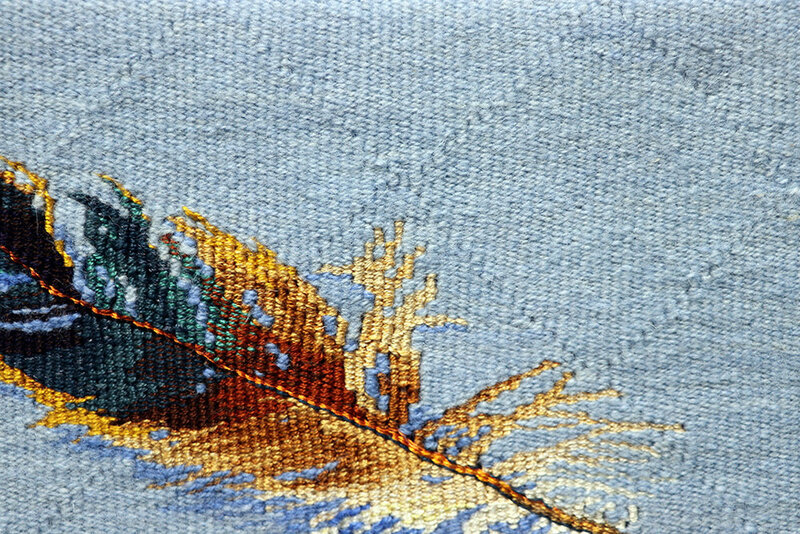 These tapestries were such exciting depictions of feathers. Most of the fiber was wool and cotton though there was a little silk thrown in. This show also included her mudras pieces. This is the first time I’ve seen these pieces in person. I was able to ask Barbara some about how they were made (fascinating! But I’m not going to tell you her secrets) and talk to her about the use of technology in her work. She has clearly enjoyed using smashed pieces of cell phones and other electronic bits in her work. The ultimate recycling, she also comments on the place of technology in our world and makes us think about how we use it and why. 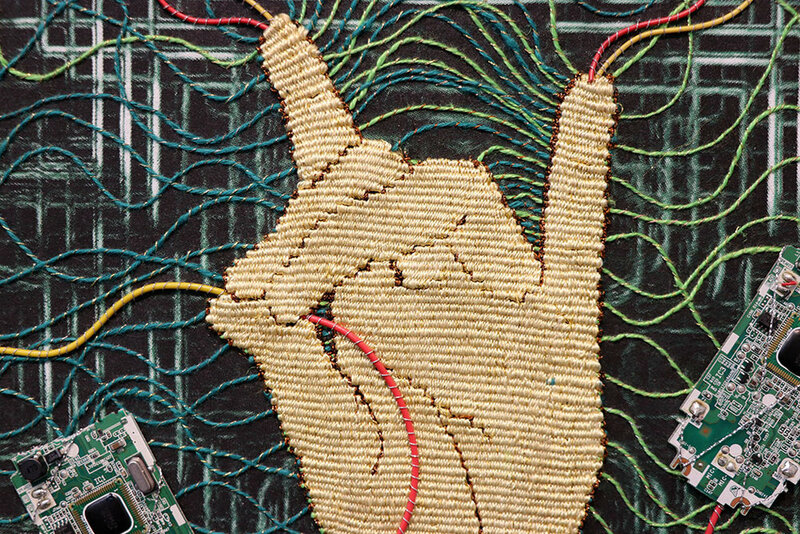 The Future Reliquaries series also addresses technology along with weaving and religion. 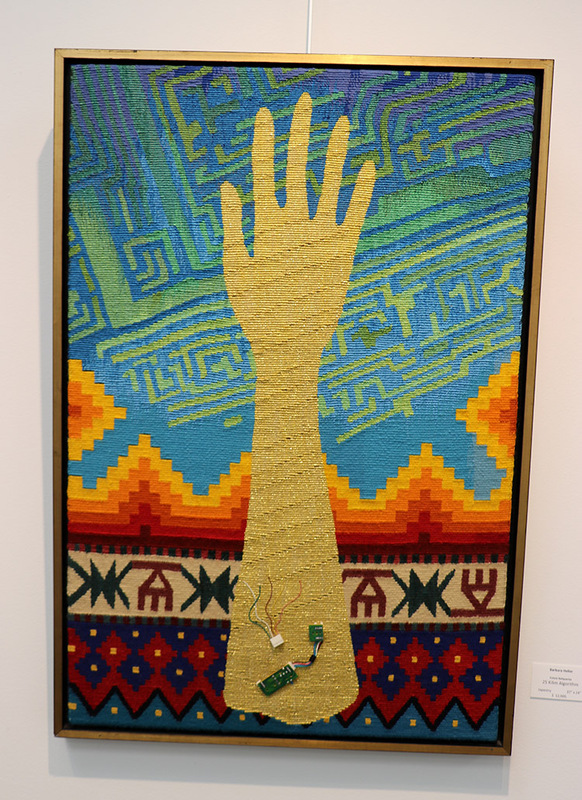 These pieces which prominently feature hands, addresses how we as humans currently worship the technology we use. 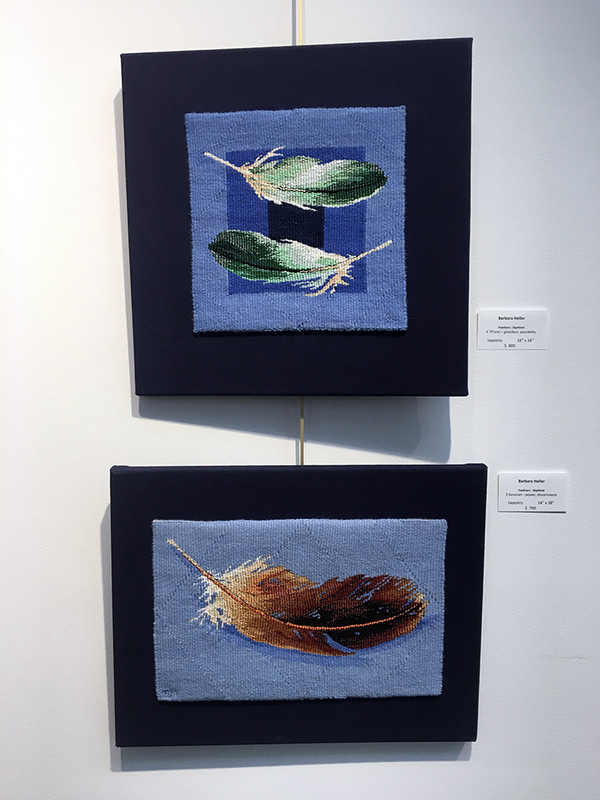 In her show notes, Barbara talks about how weaving is a binary system just like computing. She goes on to say, “Religion is not only a store of faith, it is a store of history and social values.” She explains that in the middle ages relics of saints (often bones) were housed in beautiful reliquaries and displayed in churches. 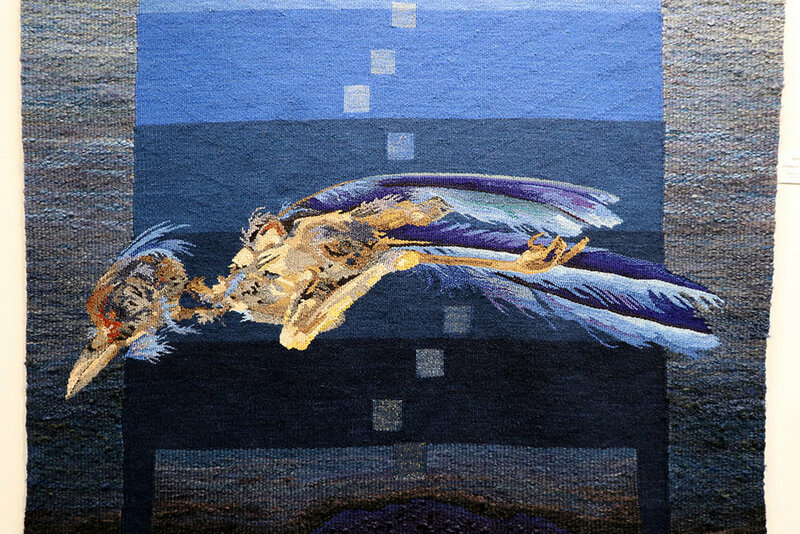 These tapestries depict the future holy status of today’s e-junk in the context of the ancient fabrics that gave birth to the binary system. 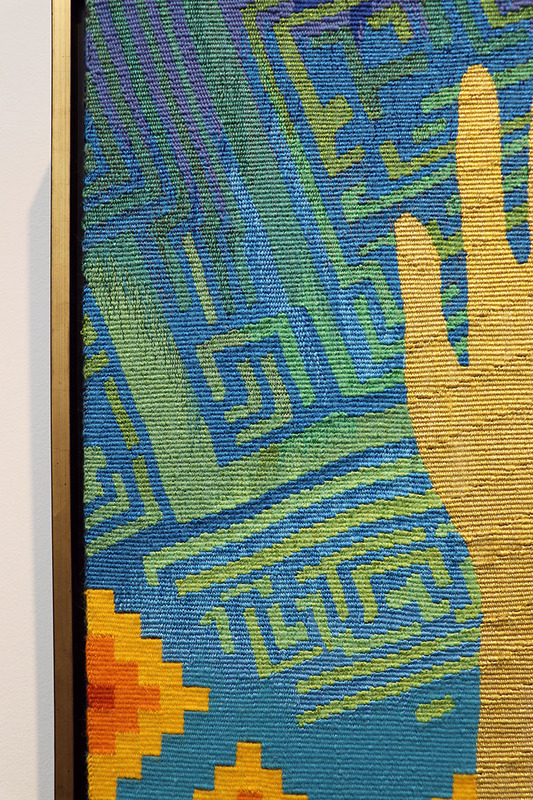 In these tapestries, one code of up/down (weaving) morphs into the other code of on/off (computing). 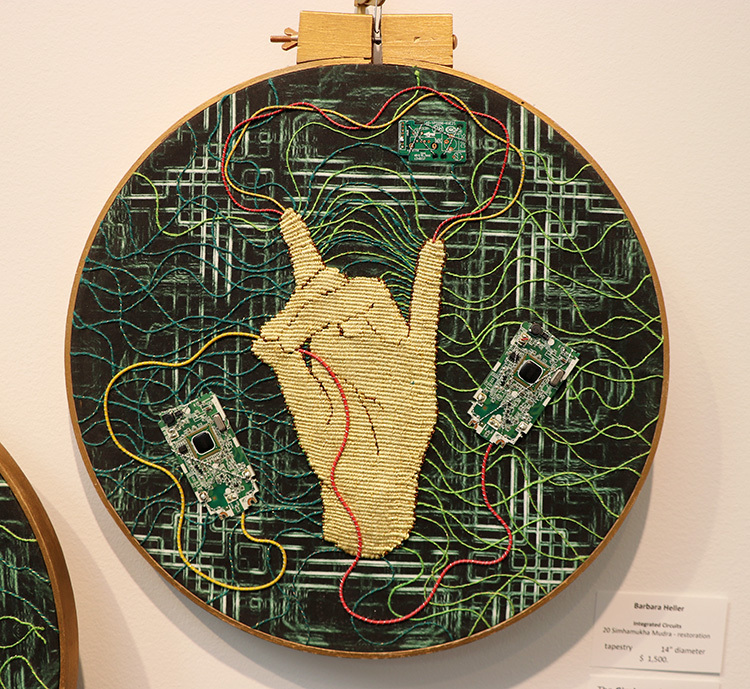 The pattern of the mother board or silicon chip morphs into the pattern of a traditional ethnic textile — contemporary computer parts as the concrete symbols of the birth of a religion. And the slits in the woven arm as the receptacles connecting the computer tower to the outer world. 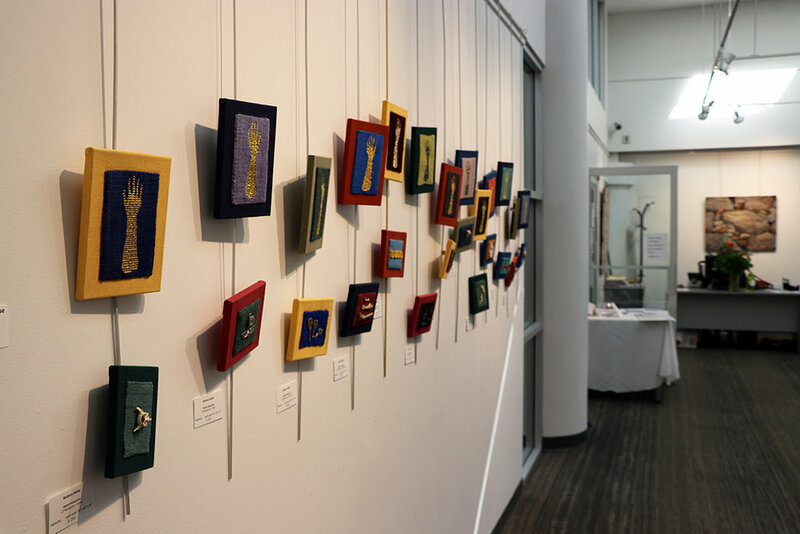 There was a delightful series of small paired pieces called Diptych Reliquaries. 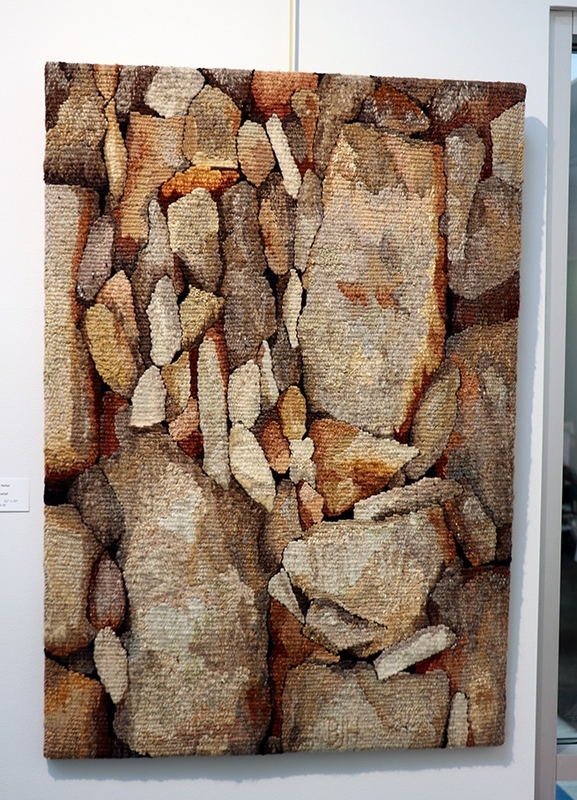 And there were two of her marvelous stonework tapestries also included in the show. While we were looking at the show, I asked Barbara some about her practice and if she had any advice for younger artists. She said that she had had a teacher early on who told her to weave every day. She replied that often she didn’t know what was next. She didn’t have an idea for a new piece yet, so she was waiting for that to happen. The teacher replied that it didn’t matter. She should weave every day. If she didn’t have a new idea, she should weave her sketches or anything else she could think of. Just weave. As someone who often finds herself in that place of “I don’t have the next idea worked out,” I found this to be exceptional advice. I think that the practice brings you through the times where you don’t feel an idea bursting out. The weaving itself will result in new experiences and the next piece will come quicker this way. Barbara took that advice. She weaves every day and her vast body of work is testament to that. Barbara Heller and Beatrijs Sterk in discussion of Barbara’s work and show at JCC. Barbara’s studio has been on Granville Island for decades. During the recent Textile Society of America conference, I was able to visit the studio with these lovely people on a Friday evening open studio walk. 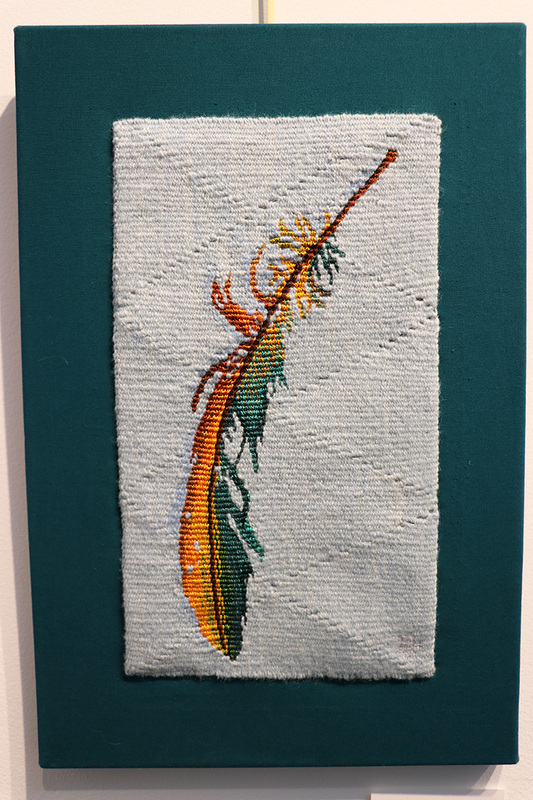 You can visit the studio which she shares with some other fiber artists and view a lot of her work. Below is a gallery with more photos of the show. If you get the blog via email, you may want to view this on the internet so you can see the captions that go with the photos (go HERE). Click the thumbnails to enlarge, hover for captions. A 2014 interview on the Zone One Arts website HERE. In this interview, Barbara says, “I do believe that if you want something to happen, you should just plunge in and make it happen.” I have to agree. A text interview on the World of Threads Festival website HERE. 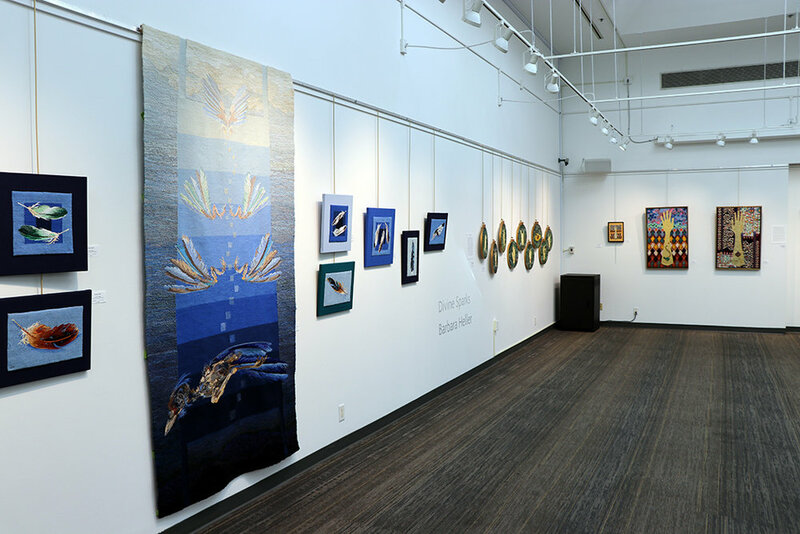 Barbara Heller is an example of an artist who is firmly embedded in her tapestry community, constantly volunteering and bringing the joy of weaving and fiber art to people all over the world. She also does a lot of work in her social community. And she still manages to weave every day.